German researchers studied the food intake of 280 obese adults and 100 of normal weight. The subjects kept records of everything they ate over two weeks, and were carefully instructed about the importance of writing down what they ate as soon as they ate it. For both groups, a large breakfast simply added to the number of daily calories they consumed. Whether they ate a large breakfast, a small one or none at all, their nonbreakfast calorie intake remained the same. This may mean that exactly the opposite of the commonly offered advice is correct: A smaller breakfast means fewer daily calories consumed, not more. So what exactly does this all mean? Should we ban eggs from our morning repertoire, or my personal fave — greek yogurt and blueberries? Does coffee now count as breakfast? Before you toss your oatmeal in the garbage, here is my take on the new research. 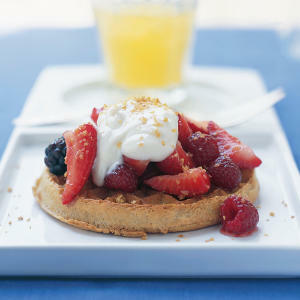 Yes, breakfast adds to your total calories for the day. DUH! So does lunch and dinner. But should you not eat breakfast anymore? No. But breakfast should definitely be tailored to your own personal tastes. For example, I’m not usually all that hungry in the morning, but I start to get a little peckish around 10 or 11. I usually will have a yogurt or a small bowl of oatmeal, just to keep me sated and so I don’t end up ravenous come lunchtime. Sometimes I want a little more, sometimes I want a little less in the morning. That’s just me. There are plenty of people who need a bowl of cereal, fruit and a hard boiled egg in the morning, and that’s ok too! Just as long as you balance out those choices with a lighter lunch, dinner, or snack. Good advice to follow is this – treat your diet like a bank account. If you spend more on breakfast, maybe you might want to scale back on lunch or dinner, or even eat a smaller breakfast the next day. Looking at your diet on a daily (and even weekly basis) can help you stay healthier in the longterm. Most importantly, you should always eat when you’re hungry!! — being cognizant of internal hunger cues is incredibly important and can lead to a much healthier, happier life in general! Intuitive eating — eating when you’re hungry and stopping right before you feel full (on a hunger scale of 1 to 10 you should be about a 7-8). So if you don’t like breakfast, you shouldn’t feel bad about not eating it – but you might want to consider have a little something small before lunch). If you’re ravenous in the morning…EAT! I find that I’m better off waiting an hour after I wake up to eat even if I’m starving. The desperation goes away after a few minutes and I make better choices. Perfect material! I have already been searching for something similar to this for some time now. Thanks for your insight!